Adorable Wedding Concepts has 15 years experience creating wedding ceremony setups and styling wedding ceremony packages for all occasions. Our ceremony package range has been designed to incorporate features that brides and grooms look for in a wedding ceremony setup. The Eternity Wedding Ceremony Package is $980 including gst (some venues may incur a delivery fee) and comes with the following wedding ceremony decorations. We can add colour to your wedding ceremony package with sashes to the last row of chairs. This will create a simple and effective look that breaks up the traditional white. Use a colour that isn’t too vibrant and the effect is very subtle and stunning. You can add in our coloured bucket ceremony aisle decorations which we fill with a rose floral arrangement for effect, as seen below. Low lying floral beds are a perfect way to create a beautiful wedding ceremony aisle. 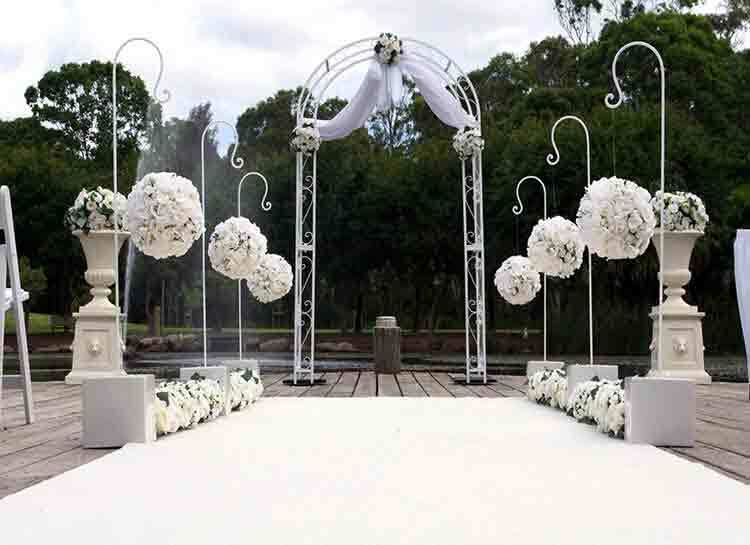 We use white rose floral beds that can be used with an aisle runner or simply positioned to create a ceremony aisle on the natural grass or pathway. Add in hanging floral aisle decorations and a few of additional Adorable Wedding Concepts decorations like our wedding arch or even our large wedding love sign and you can create a stunning wedding ceremony package that will look classic and timeless. Adding colour to your wedding ceremony package is a move away from tradition but creates a spectacular effect and can be used to match your wedding ceremony theme. As seen in the image below, we’e created a spectacular look using vibrant blue floral arrangements in both the wedding ceremony aisle and floral pedestals. 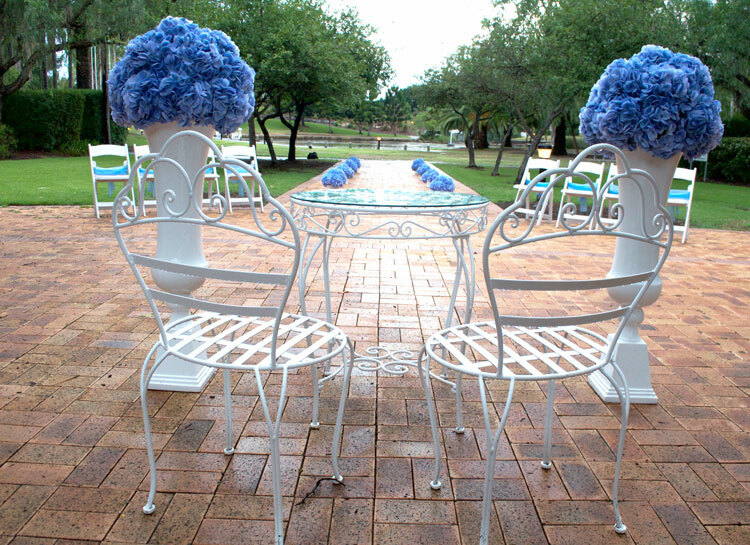 Couple this with tasteful blue sashes on the chairs and you can achieve a unique look for your ceremony setup. We have a range of wedding ceremony package hire options available: Princess Wedding Ceremony Package, Elegance Wedding Ceremony Package and Eternity Wedding Ceremony Package. Each of our settings offer something different and you’re welcome to customise a setting using one of wedding ceremony packages as the base to start from or create completely unique wedding setup with a style all of your own. 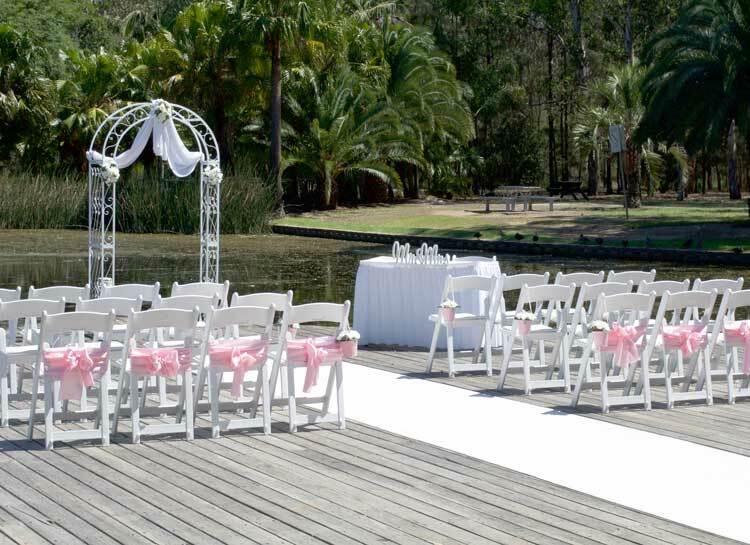 Our wedding ceremony packages will suit all outdoor ceremony locations whether it’s on a wharf, in a Botanic Garden or a backyard garden. And having been in the wedding business for over 15 years, we’ve covered just about every wedding ceremony location throughout Sydney so you can be confident in our knowledge and understanding of wedding ceremony package hire and decorations. We look forward to discussing your wedding ceremony with you. Call us on 0418 624 225 or enquire today for a free consultation and discussion about your special day .